Ok, this one’s going to be tough. What do you call something that’s not quite an octave pedal, not quite a ring modulator, not quite a harmonizer? 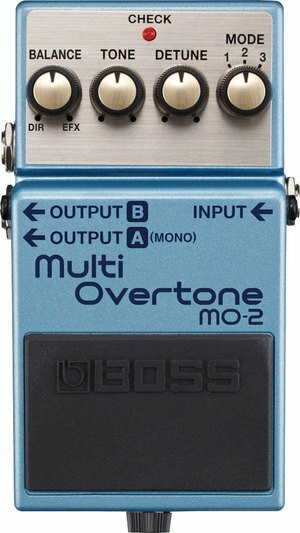 Let’s start with the “BOSS MO-2 Multi Overtone,” and work from there. Trying to describe it is like trying to describe the colors of the wind. Make sense? BOSS uses their MDP (Multi-Dimensional Processing) to really expand the capabilities of this unit. You can pull out organ sounds, flutes, steel drums, 12 string guitars, and more. A 3 position Mode switch give you varied tone options, which, along with Detune and Tone knobs even more sonic options. Use the Balance control to blend the dry and wet sounds, and the rest is up to your imagination.